Day 160 – I am Afraid Your Car is Wet, Barry. I am Afraid Your Car is Wet, Barry. This entry was posted in 365 Day Photography Challenge and tagged 365 Photo Challenge, car, rain, red, water by Cyndi the BookChick. Bookmark the permalink. 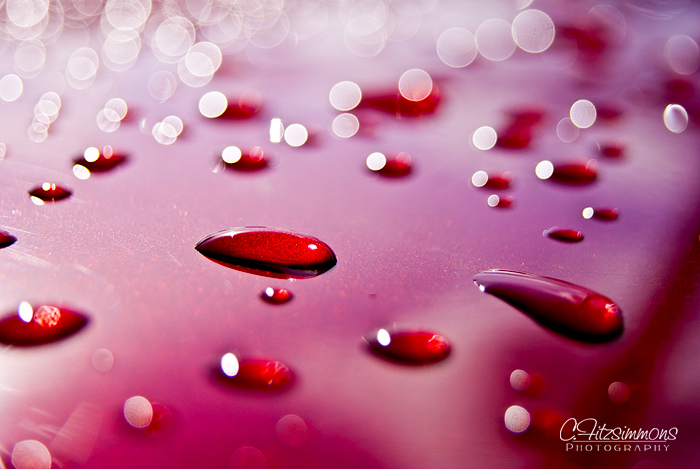 Droplet photographs are always great. Your composition for this shot is brilliant as is the DOF. I like the way some of the drops are blurred creating a bokeh like effect. I wouldn’t ever have known that this was a car!! Simply amazing, the bokeh is great! It was a good moment, and one that I was so happy to have my camera ready and in hand for!